Thank you so much to everyone who entered my very first giveaway! 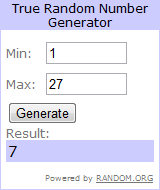 There were 27 entries so I plugged the numbers in random.org and the winner is…. Doesn’t that sound lovely? I’ll have to dress up one day this weekend to ensure I feel like that! I know I told you I would post all the goodies today as well, but I realized that if I did, it wouldn’t be a surprise for the winner! I’ve decided instead to wait until miss Genavee receives her box of beauty to share with you what she won. I'm so excited for the surprise! Thanks again.